Buy Lettering Flats by Scharff Brushes sold here. Manufactured by Scharff these Flat style lettering brushes for hand lettering and sign painting. Brushes can be used for large fill in areas, truck lettering and billboards. These brushes are normally used for larger lettering and production lettering. They also work great as fill-in brushes and outliners for large letters. 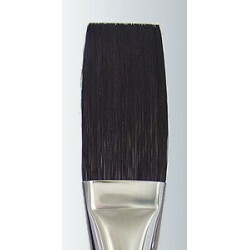 This style brush can hold larger amounts of paint.